Sophisticated and classic...Brighton provides the perfect addition to your dress/casual wardrobe. Casual in spirit but Aloha in feel...the Kahala collection is all about easy, comfortable style. Hawaiian-made for high temps and humidity...nothing feels so cool, while looking so good. Since 1995, Captain's Landing luxury menswear has been offering only the finest men's resort fashions found under one roof anywhere. 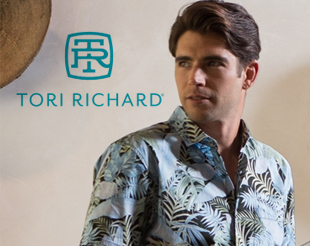 We currently offer an eclectic collection of smart and comfortable men's apparel and accessories featuring men's resort and beach wear from exclusive brands such as Tori Richard, Kahala, Bamboo Cay, Hook and Tackle, Brighton Belts and much more. For only the best in men's resort lifestyle clothing that define both luxury and confident style, you've come to the right place…Captain's Landing. Captain’s Landing offers a different approach to shopping for resort wear online. By focusing exclusively on designer brands of resort wear for men, we offer an unparalleled selection of fine fashions for men seeking to look their best on the beach or anywhere adventure takes them. Luxury menswear lines include Men’s Shirts, Men’s Shorts, Men’s Pants, Men’s Jackets and Outerwear, Belts, Men’s Shoes, and Men’s Gifts & Accessories. From our brick & mortar stores located in Punta Gorda and Venice, Florida, our style experts offer expert advice to help you find the right look for any occasion. We offer the same legendary customer service with an even broader selection through our website. So browse around or contact us before your next beach vacation, fishing excursion, golf outing, or just to look great around town. Get prepared ahead of time by shopping for island wear before setting sail. We make it easy to gear up with the best in fine men’s fashion when traveling to island or resort destinations. Luxury designer brands include: 34 Heritage, Allora, Bacchi, Bamboo Cay, Bills Khakis, Brighton, Cutter and Buck, Go Barefoot, Greg Norman, Gulf Coast Spice, Hook and Tackle, Kahala, Luau, Margaritaville, Missani Leather, Paradise Found, Petrocelli, Quiksilver, Reyn Spooner, Solar System, Sportif, St Croix, St Johns, Tilley, Tommy Bahama, Tori Richard, Torino Leather Co., Ultimo, Weatherproof, Weekender.